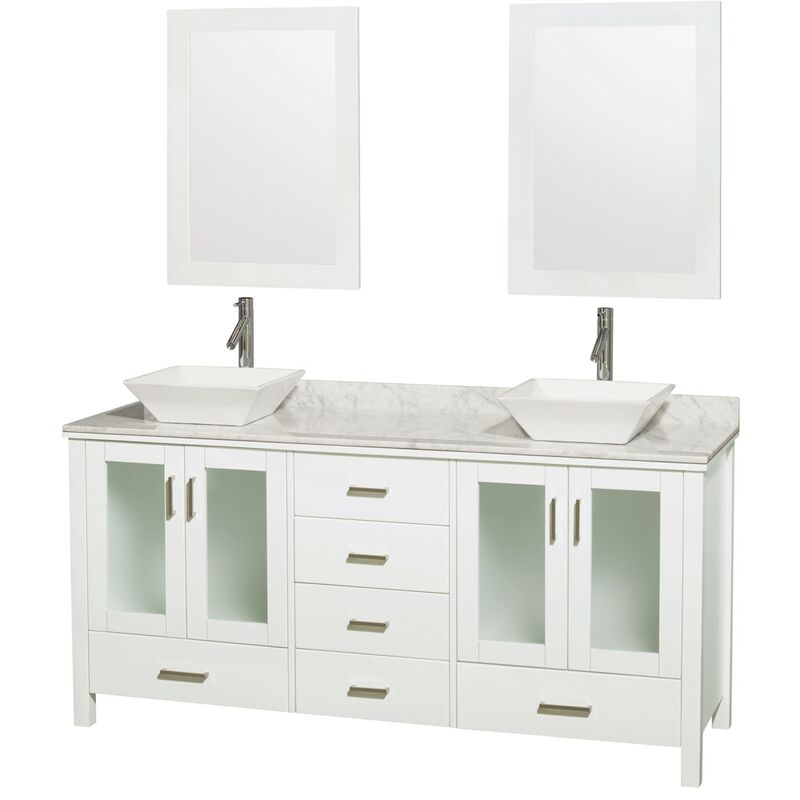 The Lucy Double Bathroom Vanity by Wyndham Collection is as beautiful as it is functional. The modern design puts a visual emphasis on clean lines, luxurious natural marble, abundant storage for two, and is at home in almost every bathroom decor. Included in the Lucy Double Bathroom Vanity are either solid White Carrera Marble or Ivory Marble counters, a multitude of sink options, and a pair of matching mirrors. Featuring soft-close door hinges, you'll never hear a door slam shut again. A rich white finish, four doors, and six drawers, and the ease of installation of a free-standing vanity are among the features. The Wyndham Collection is an entirely unique and innovative bath line. Sure to inspire imitators, the original Wyndham Collection sets new standards for design and construction. Constructed of environmentally friendly, zero emissions solid Oak hardwood, engineered to prevent warping and last a lifetime. Highly water-resistant low V.O.C. Finish. Contemporary but practical design. 12-stage wood preparation, sanding, painting and finishing process. Floor-standing vanity. Deep doweled drawers. Fully extending side-mount drawer slides. Soft-close doors. Concealed door hinges. Single-hole faucet mount. Plenty of storage space. Includes matching mirrors. Metal hardware with brushed chrome finish. 4 doors, 6 drawers. Faucet not included. Dimensions - Vanity: 72" x 22.75" x 35"; Mirror: 24" x 1" x 33"